I mean what I say. Yes, now that I got your attention, I shall not leave you disappointed, and shall explain fully, what I just said and why- that I admit- we are Talibans. I'll tell you about our Jihad as well and how we perform it. As I type this, I can feel the heat rushing up to my cheeks. But I really need to write this and get it out. I know for some people, long posts can be daunting but it’s my kind request for Muslims and non-Muslims to please hear me out, keeping up with me till the end, before making any conclusions. I would be very grateful for that. So as I continue, you might understand what I’m trying to put across, and I’ll also tell you what evoked me to write this. “Seeking knowledge is an obligation upon every Muslim.” (Narrated by Ibn Majah) It's not only a basic human right, but also an obligation for Muslim parents to educate their children. Is China a Muslim country? No. But for the sake of knowledge, this should justify that studying abroad should be permissible. Does this sound unfair? In Islam, we are allowed to raise our voice against oppression. We are obliged to. You may get the gist, I still haven’t explained why I said what I said in the beginning. I’ll explain everything. I’ll begin with what triggered this. This has been stirring up in me- how things are getting sour with Muslims regarding non- Muslims and vice versa and now, the incident regarding the attack on Malala Yousafzai; I’ve been praying for her well-being all along. The Taliban claim to do have done it; and that it’s permissible in the Shariah law. So anyone calls and claims it and it is believed? 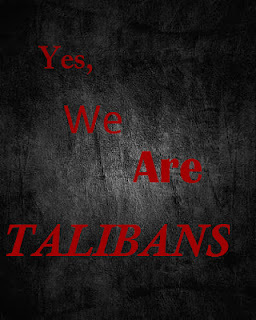 It’s known for a fact that the Taliban NEVER kill women and children, since they believe themselves to be very virtuous. They would never blow up mosques. I don’t know who did it. But they’re not Muslims. Now, it’s said that it’s according to the Shariah Law. Well, they’re WRONG. No Muslim can ever do such a thing. Muslims are not terrorists. Terrorists are terrorists. A lot of insulting things are being said about Islam. What is being made of the beautiful religion I follow? I demand respect, at least from those who seek knowledge like I do. NO religion promotes violence. And as much as people would say how Islam is unfair to women, they should do some research from non-biased sources and ask Muslim women, those who are not oppressed by a law, culture or men in the name of Islam. Ask me. I just want to tell everyone that no religion promotes such discrimination. TERRORISTS HAVE NO RELIGION. In my mother tongue, Pushto, Taliban means students. It hurts me, when I see the word being used to describe inhumane people. Humanity comes first in Islam. Aren’t we all seeking knowledge? Aren’t we all students? It’s ridiculous when people say women in Islam are discouraged from education. ‘A’isha al-Siddiqa, mother of the faithful, was a hadith-narrator, scholar, intellectual and jurist of great standing. She is believed to have reported 2,210 traditions, outnumbering those reported by men. Hazrat Khadija, our Prophet’s first wife, was a successful businesswoman. Christians don’t hate Jews. Muslims don’t hate Christians. Whites don’t hate Blacks. The rich don’t hate the poor. Races don't hate races. HATERS HATE. The world is unfair. And I don’t want anyone to spoil our harmony we can have. I want peace. And the more people who get together in this humble action, the more we can revive humanity and diminish hate. It’s as simple as that. Stop hating. Stop judging. Let’s come together. Let’s spread the love by sharing. OUR REACTION TO ALL THIS SHOULD BE JIHAD. Jihad has the literal meaning of exerting our best and greatest effort to achieve something. It's what I do every day. It's what everyone can do. To fight against oppression, to fight against evil, even if it's evil desires in our hearts. Strive in the way of education and righteousness. This is what the events should motivate us to do. Assalamualaikum(may peace be upon you).